The new Chair was announced at McGill today by Senator Larry Smith, on behalf of the Honourable Ed Holder, Minister of State (Science and Technology). This is McGill’s second CERC. The first, Dr. Luda Diatchenko, Canada Excellence Research Chair in Personalized Pain Medicine, was announced in September 2013. With this announcement, there are now 21 chairs in place at 15 universities across the country. Prof. Rogers said he is eager to help build on McGill’s outstanding strength in new, green manufacturing technologies. “McGill is the best place in the world to be working to take sustainable technology to fruition,” he said. Under the CERC Program, the university will receive up to $10 million in funding from the federal government over seven years to support Prof. Rogers and his team’s ambitious research program. In addition, funding for research infrastructure will be provided by the Canada Foundation for Innovation, the government of Quebec, and McGill to make available advanced equipment and modern laboratory space, valued at over $10 million. Since its launch in 2008, the CERC Program has positioned Canada as an international leader and destination of choice for research and development, and continues to attract and retain world-leading researchers. The CERC Program is a tri-agency initiative of the Social Sciences and Humanities Research Council, the Natural Sciences and Engineering Research Council, and the Canadian Institutes of Health Research. It is administered by the Chairs Secretariat, which is housed within SSHRC. 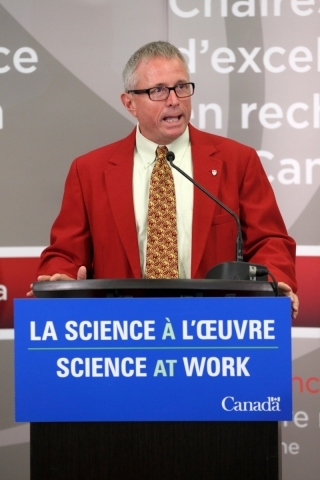 Dr. Robin Rogers, one of the world’s most renowned green chemists, will become Canada Excellence Research Chair (CERC) in Green Chemistry and Green Chemicals at McGill University. Rogers comes to Canada from The University of Alabama, where he was Robert Ramsay Chair of Chemistry and director of the Center for Green Manufacturing.